Available Plettenberg Bay and Knysna, Hermanus, Cape Town, Port Elizabeth and Shelly Beach KZN. ZAR 650 – 950 per person depending on area. Dolphin tours South Africa: Dolphin watching tours and boat charters are available in most coastal regions of South Africa. 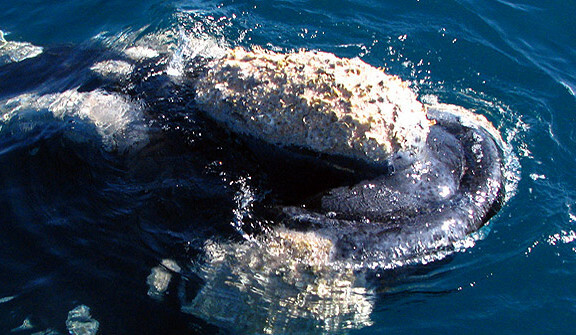 Outside of whale season there is still every reason to take boat based tour. Healthy populations of dolphins are to be found in almost all coastal regions and there are fantastic sightings to be had on any marine tour. Dolphin species most frequently encountered include, bottlenose (Tursiops aduncus), common (Delphinus capensis), and humpback dolphins (Sousa chinensis). Dolphins on the Garden Route: The Garden Route offers perhaps the best chances of dolphin encounters, with charters leaving from Plettenberg Bay, Knysna and Port Elizabeth. These two hour (approx.) boat-based dolphin watching charters are offered daily, on demand. After an exciting launch you will explore the local area and focus on finding dolphin activity. 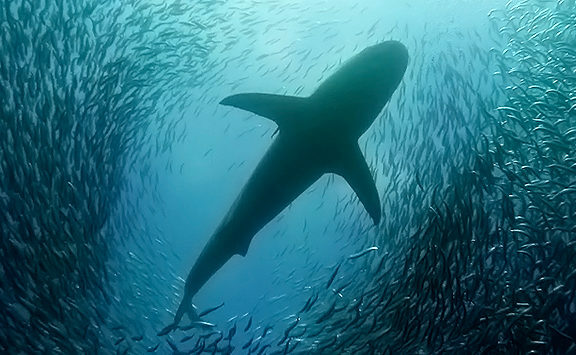 As well as finding dolphins there are year-round sightings of Bryde’s whales in the Western Cape, Cape fur seals, sharks, sunfish (Mola Mola) and a wide variety of pelagic birds that are frequently found offshore. 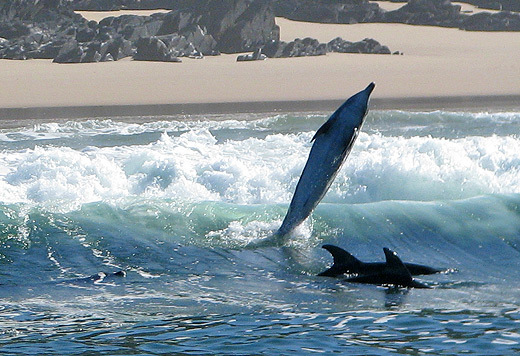 With an average group size of over 120 dolphins and a 90% successful sighting rate, you are unlikely to be disappointed in any marine tour along the Garden Route. Dolphin tours in Cape Town: The waters surrounding Cape Town support perhaps the widest variety of dolphin species, although sightings may be less consistent than in other areas. 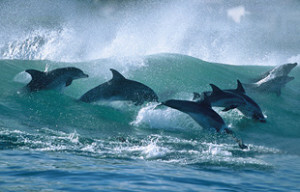 Depending on the season you may find, common, bottlenose and dusky dolphins in False Bay. A marine tour on the Atlantic seaboard may reward you with common and dusky dolphins as well as the chance of finding Heavysides’ dolphins in the Granger Bay area, where there is a more or less resident population of these energetic little cetaceans. With stunning views of the mountains and the city and a very good chance of finding dolphins, penguins, seals and whales, an ocean safari from Cape town is seldom less than spectacular! 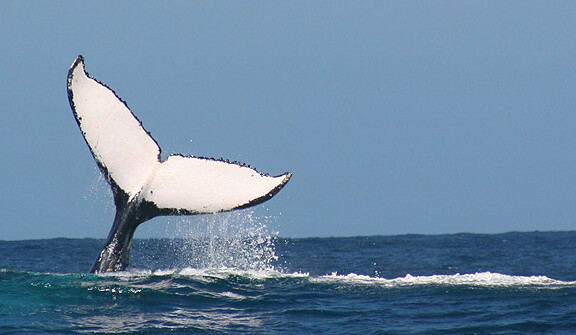 All whale and dolphin watching charters offered by Oceans Africa can be included into any of our standard tours and packages. Why not create your own custom tour package, by using our on-line quotation form, or simply send us an e-mail and we can work on an itinerary for you ! Prices Exclude: Transfers, all meals and refreshments unless stated, personal expenses, medical and travel insurance and anything else you can think of. Terms and Conditions: Prices vary between regions and may change at any time. Special rates available for groups on request. Payment in full secures booking. As with all wildlife tours there are no sighting guarantees.